Popular at Asian restaurants, lettuce wraps make a great appetizer or main dish. 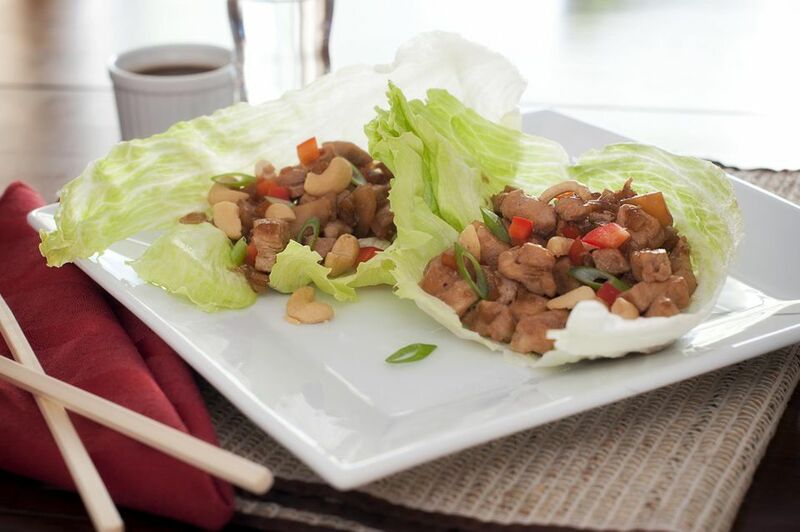 These delicious chicken lettuce wraps are made with an oyster flavored sauce. Note: If you are on a gluten-free diet, this can easily be turned into a gluten-free recipe by using gluten-free brands of Oyster Sauce and Soy Sauce and making sure all your other condiments are gluten-free. Wash the lettuce, dry, and separate the leaves. Set aside. Mix together the sauce ingredients. Heat the sesame oil in a non-stick frying pan on high heat. Add the garlic, ginger, and green onions and fry until the garlic and ginger are aromatic. Add the chicken and cook until the chicken is browned. Remove the chicken from the pan and set aside. Add the red pepper, water chestnuts, and celery to the frying pan. Add the sauce ingredients and cook over medium heat, Give the cornstarch/water mixture a quick stir and add to the sauce, stirring to thicken. Add the chicken back into the wok. Cook for 2 to 3 more minutes, stirring, to heat through and finish cooking the chicken. Lay out a lettuce leaf and spoon a heaping teaspoon of the chicken and vegetable/sauce mixture into the middle. The lettuce wraps are designed to be eaten "taco-style," with the lettuce/chicken mixture folded into a package. Continue with the remainder of the chicken and lettuce leaves. Serve. Variations: Try substituting different vegetables, or using one of the many stir-fry sauces that are now on the market in place of the sauce.